The Eco Air ECOD950E is a commercial dehumidifier optimized for use in swimming pools and other applications where water spay and splashes may come into contact with the unit. These may include spas, hydro-therapy facilities and food preparation areas and the dehumidifier is certified against water spray from any direction to the IP44 standard. 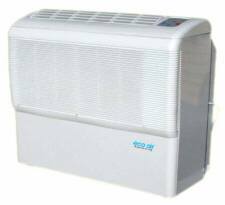 This dehumidifier is also suitable for use in stores, museums, archives, libraries and other applications where its relatively small size and weight may be valued. The ECOD950E is very similar to the lower capacity ECOD850E, compared with which it is a little wider and heavier. The increase in size reflects the increased power of the 950 which will remove one third more moisture from the air than the smaller model. It provides similar advantages to the 850 but is suitable either for a larger area, or where a dehumidifier operating for fewer hours per day would be preferred. The Eco Air ECOD950E swimming pool dehumidifier provides two installation options. The unit may be free-standing, for which feet are provided for attachment to the base, or it may be wall-mounted using the kit included with the dehumidifier. Wall-mounting is clearly helpful if space is limited and eliminates the risk of damage to the unit arising from accidental or deliberate action by users of the area, a wise precaution where high spirited youngsters are enjoying leisure time. If the free-standing installation is preferred it would be advisable to secure the dehumidifier to an adjacent wall as its relatively light weight would make it vulnerable to toppling following an accidental impact. The Eco Air ECOD950E is not configured for a ducted installation and must, therefore be installed inside the enclosure requiring dehumidification. Swimming pools and spas are typically maintained at comfortably warm ambient temperatures and by their nature generate relative humidity levels in the higher ranges. The moisture extraction rate of the Eco Air ECOD950E was rated at 30°C and 70% relative humidity and bearing in mind the environment for which it is designed this unit is very likely to achieve the stated figure of 60 litres per day. The same may be true of a warm food preparation area but, of course, the amounts of water removed are likely to be lower in other applications, such as museums and libraries. The condensate is removed by a gravity fed continuous drainage system which will require discharge to a nearby drain at a level below the discharge port. The wall-mounted option will obviously assist the water flow but if the condensate can only be discharged to a more distant outlet, or to a drain at a higher level, a separate condensate pump will be needed. The lack of an integral condensate pump in this dehumidifier may, therefore, be considered to be a disadvantage in some applications. An adjustable humidistat is incorporated in the Eco Air ECOD950E with which the preferred level of relative humidity may be selected. The unit will maintain that level, cycling on and off as required, provided that the area of operation does not exceed the capacity of the dehumidifier. The unit offers two fan speeds and, since the fan is the major source of noise, selecting the lower speed will reduce the sound of the dehumidifier. A lower fan speed will, of course, reduce the moisture removal rate so will only be an option where the unit is working well within its limits. The noise level is 56-58 dB which is comparable with that of a large room dehumidifier and commendably low. The most notable features of the Eco Air ECOD950E are its relatively small size and low weight. The unit measures 705 x 380 x 775mm and may be considered compact in its class. The unit has a net weight of 44Kg, which will facilitate wall-mounting. The small size and weight of the ECOD950E make the installation of multiple units to control humidity throughout a larger area an attractive option for some operators. A single, larger unit would be more energy efficient but, unless ducted (or supplemented by fans) will be less effective in a large area than two or more smaller dehumidifiers. If the dehumidifier is to be used in a swimming pool or similar application its ambient temperature operating range of 5°C to 35°C is unlikely to be of concern since the prevailing conditions will be ideal for a refrigerant dehumidifier, at least while the facility is in use. The Eco Air ECOD950E will perform less effectively towards the lower end of its temperature range and will be far less suitable for an application where the ambient temperature is typically less than 15°C. Other features of the ECOD950E include washable air filters and electronic, soft touch controls, monitored by means of a digital display.